Halo-halo. Photo by Bing Ramos. Jesse Vernon at Slog writes about halo-halo, a cool and sweet Filipino dessert that’s especially tasty on warm days like today. 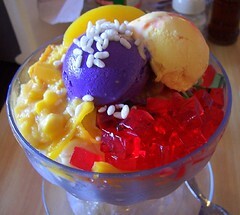 Beacon Hill may not have a trendy ice cream shop (yet), but we do have halo-halo, at Inay’s and at Kusina Filipina! In the hubbub over Link’s opening day on July 18, we missed one other local opening: big-box discount retail has come to Southeast Seattle in the form of a Ross store on Rainier Avenue South, in the former Longs Drugs next to Safeway, 3820 Rainier Avenue South. MyraMyra at the Rainier Valley Post wrote about her visit and suggested some tips for a good Ross shopping experience (hint: it’s no Nordstrom). Ross sells discounted clothing, shoes, and various household goods. Coconut ice cream is the best!